My friend, Heather, came over this week and taught me to make cake balls. She insisted that they were ridiculously easy and that I just had to try... and she was right. And now I'm not sure learning this was such a good idea since I'm already dreaming up all kinds of new cake ball concoctions. I'm not sure my waistline can handle it all! But she was right, they are super easy. Once the cake cools, crumble it in a bowl. Add the icing and stir, stir, stir. Once combined, stick that in the freezer for a couple hours. Step 4: Use a melon baller (or spoon) to make it into balls and place them on a cookie sheet. This part was lots of fun for the kids. Think playdoh, only I didn't freak out when they ate it. Place the balls into the freezer for 30 min to an hour. Follow the directions on the package of chips to melt them (it's different for different types of chocolate). Then use 2 spoons to coat the balls with chocolate. Placing them back on the cookie sheet to set. You might want to pop them in the fridge for a bit to help them "set" faster. All done! Next time I'm considering doing a chocolate & peanut butter mousse combo and coating them with milk chocolate chips. wow. I'm hungry just thinking about it. 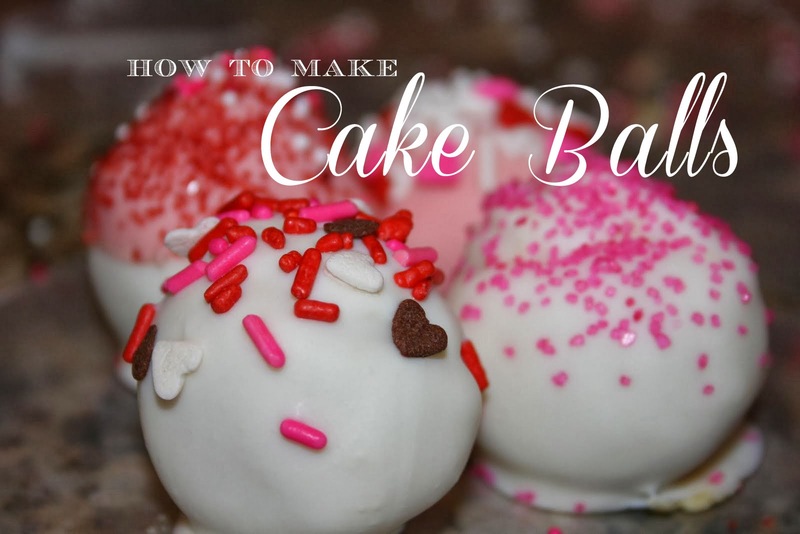 What flavor of cake balls would you make? oh wow! Those look amazing and quite easy indeed! I'll have to give them a go... perfect for a kids birthday party! How fun and easy,,,,very cute idea! I am obsessed with these. I saw these on Bakerella last year and have been making them ever since. Soooo good! OMG I can do that...but sorry I'm an idiot you crumble the cake and adding the frosting to it? You are coating in melted chocolate not the frosting?? I expect a plate of these waiting for me when I visit in April. Thanks in advance, oh crafty cake lady! oh these look SOOOO yummy. mmmmm. I make these all the time and people just love them! Yum! The pink is sp pretty! that's really strange that you posted this, because a friend of mine made cake balls today! I love cake balls! They are super yummy! They're just beautiful. I've always wondered how they were made....thanks for showing me how. Oh my goodness! I just went to my bff's daughter's one year b-day party and since the tradition is to have said baby to do a face plant in the cake, she thought the adults would prefer their own little cake balls. They were adorable. And terrible. And terribly overpriced. But I think if you made them yourself, didn't leave them to the mercy of the US postal service, and didn't rake out all that cash...that sounds like an awesomely delicious idea!